This delightful cottage dates back to 1877, and originally formed part of the Rothschild Estate in the village of Mentmore. Lilly Cottage has a lovely garden with a table and chairs to relax and absorb the countryside and ambiance of the village. To the rear of the cottage is a patio surrounded by idyllic countryside, with views stretching across fields and woodlands to the Chiltern Hills on the horizon. 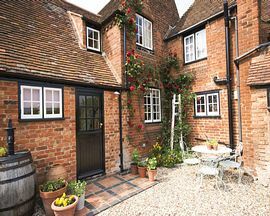 Lilly Cottage has been sympathetically renovated so as to provide convenience whilst retaining a traditional country cottage style. 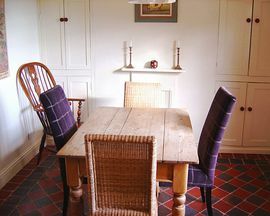 The cottage has been furnished and equipped to a high standard with excellent attention to detail. A cot and a highchair can be provided upon request and a babysitting service is also available by arrangement. Mentmore is a good location for Aylesbury, Leighton Buzzard and Milton Keynes. The closest rail station is Cheddington which is a 40 minute journey into Euston/London. 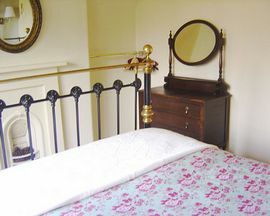 This lovely cottage has two bedrooms; a double, with a stunning Victorian-style brass bed, and a single bedroom. The bathroom has a Victorian style bath and hand-held shower, with marble tiled floors that benefit from under-floor heating and a heated towel rail. Downstairs, the kitchen has original Victorian quarry tiled floors, also with under-floor heating, and a Belfast sink. There is a washer/drier, fridge, oven and hob, slimline dishwasher and microwave. There is a large pantry storage cupboard under the stairs. A sheltered porch leads to the front door. This leads into a cosy sitting room with original wooden floors and a fireplace, three comfortable chairs and an ottoman. There is a television, video and DVD player. There is a downstairs cloakroom. The dining room has an original, ornamental fireplace and original Victorian quarry tiled floors, cupboards with dinner service and glasses, a dining table and four chairs. The rear patio area has seating for four people. Off street parking on driveway. £375.00 all year round, except 20th December - 3rd January when its £450.00.